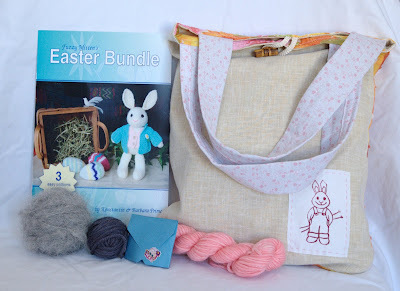 The Easter bundle kits are now available in my Etsy shop. I took advantage of a little spare time today to get all the materials together and take photos. They seem to have turned out quite nice, and I think they would make a excellent gifts. Some don't have bags, but I did give people the option of requesting one and paying for it separately. I dyed a lot of the yarn for the outfits, trying to match it to the bags, but also choosing pretty spring colours. I suppose I should get back to work and finish off that March feature pattern. Good thing February has an extra day this year! Posted by Barbara Prime at 3:33 p.m. Your kits look amazing! I am so impressed with how talented you are! February 28, 2008 at 4:10 p.m. I love oatmeal. I will have to try this recipe this weekend. Can't wait to see your pattern for March. February 29, 2008 at 7:35 a.m.